Sunday morning, I left the house before eight and drove south to Prince William County to do a trail race. I really love these races because they seem more like a party in the woods than a hard-core race. Usually, about 100 or so people show up at some Virginia state park in compression tights or old school cotton socks, in Lululemon running skirts, or in my case, frayed Adidas shorts I bought in 1999. On Sunday, I positioned myself towards the front of the pack, which I typically don’t do. By the second mile, I was running with another girl and a few men and I was having the best time. It was a spectacular morning with a bright blue sky that hasn’t been visible much this autumn. The ground was covered with gold leaves but the trees were still green and bright. I passed the girl next to me and then she passed me back. The race was everything I loved about running: there was hard work and exertion and a sense of pure joy that everyone who came together in the woods created. It was so much fun that I thought about slowing down a bit, just so I could enjoy it even more. My ankle, which I have sprained a zillion times before, turned sideways, and with an oomph of breath, I was flat on my face. The people I was running with stopped and waited while I got back up, but I shook my head. I hobbled a few steps, but I knew I wasn’t finishing the race. As I walked back the way I came, I felt like crying, as if I were ten years old again and had just been booted out of the game. People streamed by me as I walked the wrong way on the course, and I felt as isolated and alone as I ever have. I kept telling myself that I was fine, that everything was fine, but it’s a funny thing to be alone in the woods. I kept losing my way and it was cold. As I headed up the final hill, my left hand was throbbing in addition to my right foot, and when I looked down, I saw that a piece of skin was missing from my palm. Blood was trickling to each of my fingers, making my hand look like a macabre Halloween decoration. When I finally made it back to the start, I picked up my sweats and headed to the first aid tent. As usual, there was the requisite cheesy guy waiting for his free massage. “Oh wow,” the trainer – a local chiropractor – said when she saw me. “You really bashed up your knee.” I looked down at my leg. I hadn’t even noticed my knee. “Did you turn an ankle?” the trainer asked and I nodded.”Just sign in and I’ll be right with you,” she said and handed me a clipboard. I wasn’t really interested in getting worked on next to the guy with the too-tight shorts. My plan was to get a bag of ice and hit the road, but the trainer grabbed my bloody hand. “Oh my God,” she said, holding my fingers, “What are you, a marine?” This made me laugh as I am as far from a marine as you can get. My idea of camping is staying in a Holiday Inn Express. By this time, I was too tired to argue. I lay back on the table and let the trainer do her thing. I was trying to figure out where I went wrong, why I fell. I think I may have a belief that if I follow all the rules and do everything right, bad things won’t happen. And if something doesn’t go as planned, it must be something I did, something that I can prevent from happening the next time. On Monday, the day after the race, the boys and I drove to Bloomsburg, Pennsylvania, where my parents live, for my mother’s birthday. About a month ago, during that endless rain, the town had a horrible flood. The Susquehanna river rose over its banks and across the road, uphill into the town. Water covered pickup trucks to to their roofs, the farm buildings on the fairground were almost completely submerged, and some people had to leave their homes in rafts. A friend of mine told me that one morning, she watched group after group of evacuated people walking through town, wearing their pajamas. FEMA was called in as was the National Guard. I was so grateful that my parents live on top of a big hill, that despite losing power and water for a week, they were very lucky. Some of the worst damage, however, happened almost a mile from the river, when Fishing Creek overflowed its banks and washed several houses right off their foundations. My mother called me during the flood and told me about some of her friends, whose homes filled up with water. 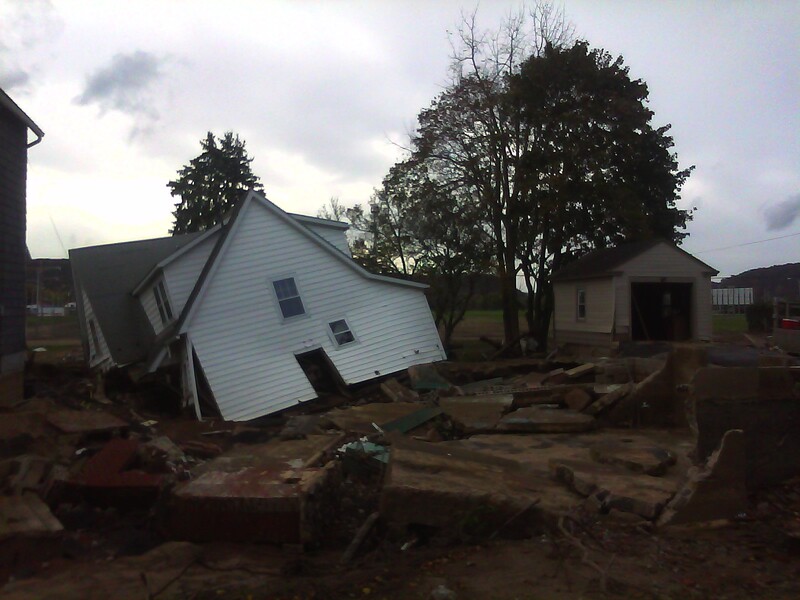 My mom’s friend B’s lovely home had eighteen inches of mud on the first floor and some of her other friends had several feet of water in their basements. My mom also told me stories about all of the people who helped. An eleven-year-old boy was able to collect enough cleaning supplies and canned goods to fill a pick-up truck. The local university wrestling team went door to door, asking people if they needed help carrying their ruined appliances to the curb. My mom said that they came to another friend’s house and carried out his washing machine, his dryer, and his useless freezer. “I wanted to pay them,” my mom’s friend told her, but they wouldn’t let him. “Just come and watch our matches,” they said. In my parents’ pristine basement, there are two wooden pallets covered with a sheet. “Those are B’s dishes,” my mom told me. My mother had taken them all home from her friend’s mud-filled home and washed them by hand. Next to the clean pots and white plates were a small stack of Pyrex pie plates. “I haven’t gotten to those yet,” my mother told me. “Just look at the mud.” I picked up a pie plate, coated in dried red clay. I scraped at it with my fingernail but the mud didn’t budge. Next to the dirty dishes was a soup pot filled with Log Cabin syrup, A1 steak sauce, rice vinegar, and cooking sherry. “She saved these too,” my mother told me, but I wasn’t going to judge. This is what happens when we fall: we clutch at what we can. B took maple syrup and I grabbed onto a rock. Standing there in the cold cellar, I felt the damage of that flood in a way that couldn’t be conveyed over the phone. That red dust. The half-empty bottles of ketchup that were saved. And I also saw into the heart of my own mother. I saw that she was the kind of person who wouldn’t say to her friend: Oh honey, just buy another set of Calphalon for god’s sakes. Instead, she stood in front of her own sink and tenderly scrubbed mud from dessert plates and soup bowls because she knew that these weren’t just a collection of dishes but a collection of memories. They weren’t coffee mugs and saute pans as much as they were Thanksgiving dinners and birthday parties and rainy Tuesday evenings. It’s true that by living in this world, you will learn what loss is. You can work your entire life to pay for a roof over your head and watch your home be washed away by the tiny creek across the street. To be true to yourself, you may have to walk alone. You will spend days feeling cold and lost and injured. But it is also true, that by living in this world, you will learn kindness. Someone may hold your bruised foot in her hands and guide the bones back into place. When you are too weak to lift another thing, a wrestling team may show up at your door. A stranger will wash your wounds and a friend will wash your dishes. About 10 years ago, my friend Cathy, who first taught me how to meditate, conned me into going on a 3 day meditation retreat with her at the Zen Mountain Center. It was only when we arrived that she explained that the retreat would be done in silence. After the first too-quiet meal of vegetarian chile and cornbread, I stood awkwardly in line, waiting to wash my dishes. When it was my turn, a man in front of me, whose name I would later learn was Tomas, took my bowl and plate from me. I tried to take them back, but he held them close to his chest and shook his head. What I wanted to say was, “Please don’t. Please let me clean up my own mess,” but that was against the rules. You should see Gus on his bike. Damn. 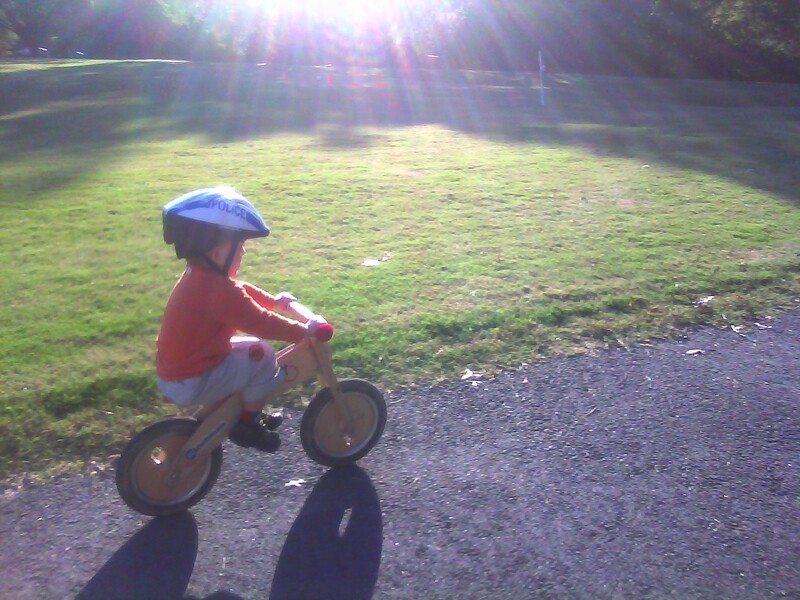 My words are useless against the beauty of his little body on his pedal-less, birchwood bike. Every time he rides it, he turns heads. People do double-takes. Some of that might be because he’s only two and a half and he’s flying down the bike path, his legs swinging like pendulums. But mostly, it’s because of his command of gravity, even as he’s poised between two spinning wheels. The best way to describe the way Gus rides his bike is to tell you to close your eyes and think of Haile Gebrselassie finishing the Berlin Marathon or to remember Jacinto Vasquez, coiled tightly on the back of Ruffian as he rode her to victory in the Acorn Stakes. Oliver is equally talented on his bicycle, but in a different way. You watch Oliver and you see each muscle at work, the beauty of a body engaged. Perhaps this is because Oliver learned to ride on a bike with training wheels. What he learned first were the mechanics, the how, and then he learned balance. Gus learned balance first, and the mechanics were secondary, which I believe is an important distinction. I may think I have balance because I can make three meals a day, host a multi-kid playdate, get Oliver to school in clean clothes, and get myself to yoga, but these are merely the mechanics. It may feel like balance but the fact is, some days, my stomach hurts. Some Most days, I have tremendous momentum but zero stillness. What I have noticed about all good athletes, is that no matter how great their velocity, there is always a still point somewhere near the heart. In the middle of all that motion, there is always a place that is motionless. Gus has that, even at two. I watch as he rides away from me, his back a tiny column of stillness, a fulcrum of quiet around which all else revolves. Usually, autumn is a smooth season for me. For years, I reveled in cross-country season, in running through trails and fields scented with fermenting leaves and fallen apples. I met Scott in October and Oliver was born on Halloween. Normally, I cruise happily through October’s blue skies and red trees. This fall, though, has been a bit different. It would be accurate to say that I am struggling a little with the back-to-school routine, with the sudden playdates and calls to be a volunteer at silent auctions and bake sales. I am resentful that my solitary summer adventures with the boys have been exchanged for shorter days, endless rain and other people. This October doesn’t look like what October is supposed to look like and it bothers me. It is either 79 degrees and raining outside or 60 degrees and sunny. There are only these bold extremes and I feel yanked between the two. Last night during another rainstorm, I hit a bunch of traffic on the way into DC (huge surprise there!!) for my yoga class. I turned on a podcast of Tami Simon interviewing Tessa Bielecki, Christian mystic, former monk and Mother Abess of the Spiritual Life Institute. Of course, she was talking about balance. “I don’t like the word balance,” she said, “as much as I like the word balancing.” She talked about that crazy tightrope walker, Philippe Petit,who did a tightrope wire stunt between the two World Trade Center towers in 1974. She said that we don’t so much find balance as we keep hovering between two fixed points. For years, I have been trying to balance life as a stay-at-home mom with the fact that I grew up in the seventies when women’s lib was in its heyday. When I was little, I had books in my room with titles like “Herstory” and “Whatever Boys Can Do Girls Can Do Better.” At some point, I decided there were two kinds of women in the world: those who raised children and those who did Important Things. Even now, I find it challenging to balance my own beautiful life with the one I thought I was supposed to live. On Monday, I went to yoga and we did a lot of handstands, which was fine with me. For almost two years now, I have been wrapped in a notion that if I can learn how to stand on my hands, I can handle anything hurled my way. On Monday night, I kicked up a into a handstand, took my toes away from the wall, and stood on my hands for more than a few seconds. I have never been in a handstand for that long before and as my weight was shifting from the base of my palms to my fingertips, I was elated. But there was a steadiness too, a sense of being reduced to only a pair of hands and a heart, hovering over the earth. I pretty much resist everything. I realize that this takes a lot of energy, but it feels safer than throwing caution to the wind and lying down, although I am not sure why. Lately though, the mechanics are beginning to wear me out and maybe this is a good thing. Perhaps this is a call to stop pedaling like a crazy person and coast for a while. Perhaps I will find balance only when I surrender to the imbalance, to the unbending truth that balance can only exist between polarity, between gravity and a tiny body, between the jagged earth and the infinite sky. You are currently viewing the archives for October, 2011 at Walking on My Hands.